Carriages for Children – Nannies Behind the Wheel! 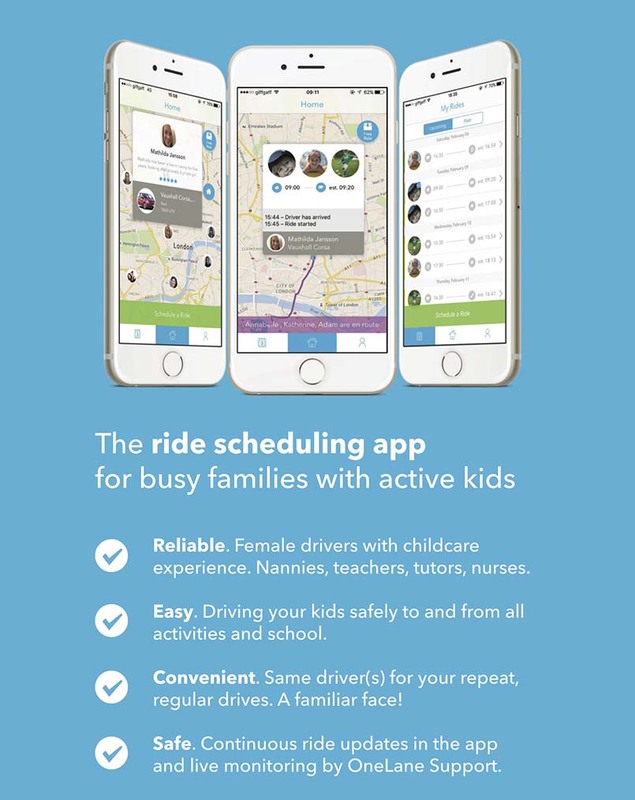 We here in the LittleBird Nest heard about OneLane, the ride scheduling app for busy families with active kids and decided to test it out for ourselves. This car service is designed specifically for families to pick up kids, aged 8+, and is currently in its beta. They are therefore currently only available in London for pick-up AND drop-off in zones 1-3. Want to try this service for yourself? See the bottom of this post for details. “February birthdays are often so tricky – short, grey days and dark, cold nights. This year there was light at the end of the tunnel – or Lane…We downloaded the App for OneLane to ferry around my daughter & her friends for her birthday treat – dinner minus parents & onto a sleep over. Being 14 now, we had agreed that they were old enough to go out without us, but it was with the help of OneLane that made it all the more fun for them and less arduous for us! We got the forecast of a rainy, cold Saturday, so after being off work with the flu, it was such a relief to have a trusted reliable driver on hand to look after the girls. No longer was I the chauffeur come hell or high water, who has to drive the journey 6 times as is usually the case. Being a one car family, it’s not always possible to be in 2 places at once. However, this time, everyone was happy! Other family commitments were taken care of and there were no late arrivals for dinner for once! No stress, on time! I was able to stay in to convalesce and cook. So with the dog fed, washed and dried there was even time to take the obligatory selfies before they left. Kate (the driver for the evening) had gotten in touch way before and that was so reassuring. One chum was even almost not able to make it but Kate went & got her. After their dinner, the girls were all taken on to a sleep over and we could rest assured that all was well – which was all confirmed to me by text! In summary, OneLane was an invaluable addition to their “night out” experience. The 4 young girls are only 13/14 years old so they are still too young to be in any way too relaxed or complacent about letting them go out alone on a Saturday night. No matter what the birthday girl had wished for we had the other parents to consider. However, the knowledge that they would be safe with OneLane made a small amount of independence possible. A big amount of pressure off parenting. OneLane goes a long, long way! It’s 24hrs lead booking time. Available for journeys in zones 1-3. This is a limited availability offer running as a first come, first serve. Activate your code as soon as possible to avoid disappointment. This car service is designed specifically for families to pick up kids, aged 8+, and is currently in its beta. They are therefore currently only available in London for pick-up AND drop-off in zones 1-3.